One of WeAllSew’s newest blog experts, Mimi Goodwin of Mimi G Style shows us that pushing your limits and venturing out of your comfort zone can be a beautiful thing! 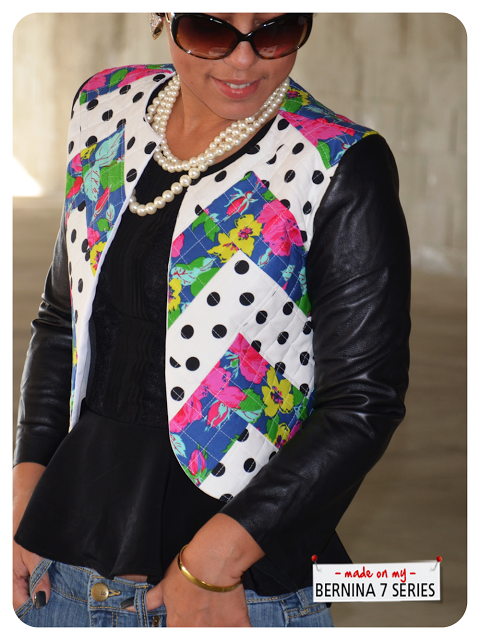 Some leather, pretty prints, a chevron zigzag quilt tutorial from Bee Square Blog and an old Butterick pattern (4926) were used to create this stylish update to the quilted jacket. Mimi confesses that she is new to quilting. “When I got my BERNINA sewing machine, I knew I wanted to quilt something because that is what you do on a BERNINA. But I had never quilted anything! I wanted to make something that was NOT what most people think of when you say ‘quilting’.” To read more and see the steps Mimi took to create this project visit her blog.